A brief discussion on heat engine and refrigerator was made in the post dated 20th February, 2007 in which you will find a few typical multiple choice questions. You can find the post by clicking on the label ‘Carnot engine’ or ‘thermodynamics’ below this post or on the side of this page. If T1 and T2 are the temperatures of the source and sink respectively, the efficiency (η) is given by η = (T1 – T2)/T1. Therefore, initially we have 1/5 = (T1 – T2)/T1 so that T2 = 4T1/5. 2/5 = [T1 – (T2 – 100)]/T1. Substituting for T2 (= 4T1/5) in the above equation, we obtain T1 = 500 K.
τ = n IABsinθ, where ‘n’ is the number of turns, ‘A’ is the area of the loop, ‘I’ is the current and ‘θ’ is the angle between the magnetic field vector B and the area vector A. Note that the area vector is directed normal to the plane of the area. So, if the plane of the current loop is perpendicular to the direction of the magnetic field, the torque is zero. The torque is maximum (equal to nIAB) when the plane of the loop is parallel to the field B.
torque, τ = IAB = I×π(L/2π)2×B since the radius of the single turn coil is L/2π. torque, τ’ = nIA’B = nI×π(L/2πn)2×B = IL2B/4πn. The torque thus reduces to (1/n)th of the torque on the single turn coil. Since n = 10, the correct option is 0.01 N.
The magnetic forces on the top and bottom sides of the loop are equal and opposite and hence they will get canceled. The force on the left side of the loop is attractive (towards the straight wire) while the force on the right side of the loop is repulsive (away from the straight wire). But they cannot get canceled since the attractive force is greater because of the proximity of the left side to the straight wire. The magnetic force on the left side = ia(μ0I/2πr) since (μ0I/2πr) is the magnetic flux density produced by the straight wire at the distance ‘r’. F = ILB = I×1×2 = 2I. The tension in the wires will be zero when the magnetic force balances the weight of the rod. Therefore, 2I = mg = 1×10 from which I = 5 A. This question basically pertains to the conversion of a galvanometer in to an ammeter. Since there are 50 divisions on the scale, the current (Ig) required for full scale deflection is 5 mA. IgG = (I–Ig)S where ‘G’ is the resistance of the galvanometer. Therefore, I = Ig(G+S)/S = 5×10–3(20+4)/4 = 30×10–3 A = 30 mA. Both poles of the 10V battery are connected to one end of the 2Ω resistor. Similarly, both poles of the 20V battery are connected to the other end of the 2Ω resistor. So, there are no continuous paths for the currents to flow through the 2Ω resistor and the current is zero. Now, suppose the above circuit is modified as shown in the adjoining figure in which the points A and B are grounded. Assuming that the batteries have negligible internal resistance, what will be the current through the 2Ω resistor? The two batteries are now connected (through the ground connection) in series with the 2Ω resistor. But, the battery voltages are in opposition so that the net voltage across the 2Ω resistor is 20V – 10 V = 10 V. Therefore, the current is 10V/2Ω = 5A. You have to subtract the moment of inertia of the portion CB from the moment of inertia of the original rod AB to obtain the moment of inertia of the remaining portion AC ( since all moments of inertia are about the same axis passing normally through O). Moment of inertia (I) of original rod AB = 12ML2/12 = ML2 (The mass of the rod in this problem is given as 12M to make the terms simple). [The first term is the moment of inertia of portion CB about an axis through its centre and the second term is the product of its mass and the square of the distance between the two parallel axes]. Therefore, moment of inertia of the remaining portion AC = ML2 – (7/16)ML2 = (9/16)ML2 = (9/16)I. [Alternatively, you can treat the portion AC of the rod to be made of the portions AO and OC and add their moments of inertia about O to arrive at the answer, remembering that the moment of inertia of a thin rod of mass ‘m’ and length ‘l’ about a normal axis through one end is ml2/3. The moment of inertia of the portion AC of the rod is therefore 6M(L/2)2/3 + 3M(L/4)2/3 = ML2/2 + ML2/16 = (9/16)ML2 = (9/16)I]. In an elastic collision, the linear momentum of the system is conserved. (i) in elastic collisions, kinetic energy also is conserved. [Remember, we are talking of kinetic energy. Note that the total energy is conserved in all collisions in accordance with the law of conservation of energy]. In an elastic collision, the relative speed of the bodies after collision is equal to the relative speed before the collision and this is a consequence of the conservation of kinetic energy. Therefore, statement-1 is true. Statement-2 also is true, but it is not the reason for statement-1. So, the correct option is (b). You might have noted that the angle between the force acting on a body and the momentum of the body can be anything between zero and 2π. (But the change of momentum is always in the direction of force). Here is a simple question which you should be able to answer in a minute. If you find it difficult you should work harder to understand basic points in mechanics thoroughly. The particle is forced to move simple harmonically along two mutually perpendicular directions. In other words, this is a case of the superposition of two simple harmonic motions of the same perod and amplitude at right angles to each other. Since the phase difference is π/2, the resultant motion is uniform circular motion. The angle between the resultant momentum of the particle and the force acting on the particle is therefore π/2. Simply by noting that the momentum vector p has simple harmonically varying components A cos(kt) and A sin(kt) in the X and Y directions respectively, you can conclude that this is a case of the superposition two simple harmonic motions of the same frequency and amplitude at right angles, with a constant phase difference of π/2. [The phase difference is π/2 since one is a sine function while the other is a cosine function]. So, this is uniform circular motion and the angle between momentum and force, as usual, is π/2. Cosθ = F.p/ Fp, where the bold face letters represent vectors. Since cosθ = 0, θ = π/2. The figure shows a surface XY separating two transparent media, medium-1 and medium-2. The lines ab and cd represent wavefronts of a light wave traveling in medium-1 and incident on XY. The lines ef and gh represent wavefronts of the light wave in medium-2 after refraction. Light rays have to be perpendicular to the wave front. Since the wave fronts are shown as parallel, the rays are parallel. So, the correct option is (a). (2) The phases of the light waves at c, d, e and f are Фc, Фd, Фe and Фf respectively. It is given that Фc ≠ Фf . All points on a wave front will have the same phase. The lines cd and ef represent the wave fronts of the same light wave at two instants. Therefore, points ‘c’ and ‘d’ have the same phase. Points ‘e’ and ‘f’ also have the same phase, but these points have the same phase lag with respect to points ‘c’ and ‘d’. So, the correct option is (c). The angle of refraction is evidently less than the angle of incidence at XY and hence the speed of light is larger in medium-1 [Option (b)]. Mobile phones with multimedia and internet browsing capabilities are becoming cheaper and this is widening the possibilities of blogs for educational purposes. Youngsters find it very convenient to use mobile phones for internet browsing and already a large percent of youngsters prefer mobile phones to personal computers in many parts of the world. For students and youngsters who restrict this facility to healthy and judicious use, there is ample scope for self development. The teaching-learning process will get a boost and the teachers as well as students will find the new generation mobile phone an important tool in their academic activities. Potentials due to the two charged shells get added to give the net potential at P. The potential at P due to the smaller shell of radius R1 is (1/4πε0)(Q1/r) since the point P is outside the shell at distance ‘r’ from its centre. 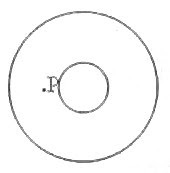 The potential at P due to the larger shell of radius R2 is (1/4πε0)(Q2/R2) since the point P is inside this shell and the potential everywhere inside is the same as the potential at the surface of the shell. The net potential at P is obtained by adding these two potentials. [This question can be modified by making one of the charges or both charges negative. You will then have to substitute the charges with the proper sign in the above equation]. What is the electric potential at a point inside the smaller shell? What is the electric potential at a point outside the larger shell? The point is then outside both shells and they produce potentials (1/4πε0)[(Q1/r) and (1/4πε0)[(Q2/r) respectively so that the net potential is (1/4πε0)(Q1 + Q2)/r. This is a very simple case since you can treat the entire charge Q1 + Q2 to be located at the common centre of the shells. Now, one more question: What is the electric field at a point P in between the two shells? You can find more posts on electrostatics by clicking on the label 'electrostatics' below this post or by performing a search for 'electrostatics' making use of the blog search box on this page. This MCQ appeared in Kerala Engineering Entrance 2006 question paper. You are required to find the angle between the lines CH1 and CH2. Treat these lines as vectors. The coordinate axes are marked (by the question setter) in the figure with H3 as the origin. [Note that bold face letters represent vectors and i, j, k are unit vectors in the X, Y and Z directions respectively]. The magnitudes CH1 and CH2 of these vectors are the same, equal to a√3. 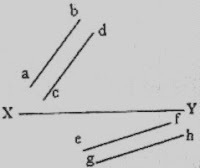 The angle between the vectors, which is the bond angle required, is therefore cos–1(–1/3). Now, consider the following question. This is a simple one, but similar questions are often seen in entrance test papers. You should remember that the direction cosines (the cosines of the angles between coordinate axes and the vector itself) are given by Cos(A,x) = Ax/A, Cos(A,y) = Ay/A and Cos(A,z) = Az/A. Since the Y-component has magnitude 1 and the vector has magnitude 2, the cosine of the angle between the Y-axis and the given vector is ½. The angle therefore is π/3. 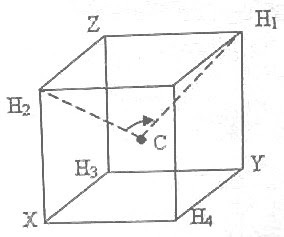 The pulling force mg applied at an angle θ with the vertical can be resolved into a vertical (upward) component mgcosθ and a horizontal component mgsinθ as shown in the figure. It is the horizontal component which moves the block along the surface. mg sinθ > μmg(1– cosθ). Or, sinθ > μ(1– cosθ). But, sinθ = 2 sin(θ/2)cos(θ/2) and (1– cosθ) = 2sin2(θ/2). Do you know why it is easier to pull a lawn mower than to push it? You have seen in the above problem that the upward component of the pulling force opposes the weight of the block and therefore reduces the normal force (N) on the surface. The frictional force μN is therefore reduced. If a pushing force is applied to move the block, the vertical component of the pushing force will be downwards and it will add with the weight of the block to produce a greater normal force and therefore a greater frictional force.